My Home and Garden: My first ever beefsteak tomato. Black Krim. My first ever beefsteak tomato. Black Krim. I have tried to grow tomatoes for four years. I could grow cherry tomatoes, but never the huge Brandywines I was trying to grow. 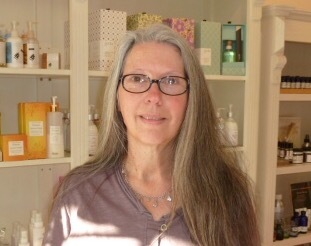 This year we had a mild spring and we have had a hot dry summer. Presto!!! My first huge tomato. 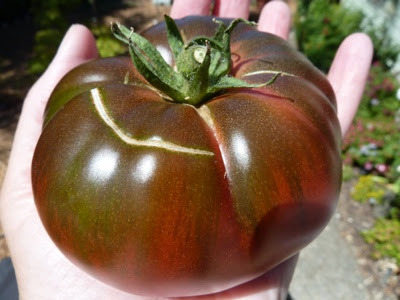 Here it is....Black Krim. 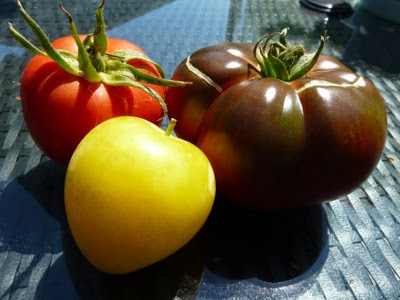 Here is my Black Krim, an Amish Paste tomato and a Shiro Plum. Yesterday and today I worked all day in the hot sun moving wood chips. I get outside and I don't like to stop for lunch. So each day, I picked a sweet, super juicy plum. They are so much better than I remembered. I think the dark-coloured tomatoes are particularly attractive. Let's hope you get plenty more! Excellent Erin. The photos are beautiful. Bet the Black Krim was delicious. Hot and dry summers are better than damp, cool and rainy ;-))). Lucky you. Black Krim was the most delicious tomato I've ever eaten. 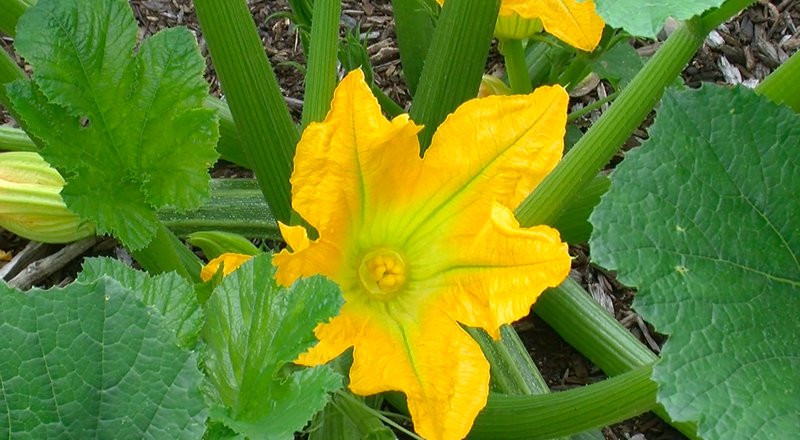 I scooped out a few seeds for next year. There weren't very many. It is a meaty, tasty and juicy tomato. We are so lucky to have this hot dry summer. You are in for a real treat!!! I have one ready to eat and I have one on the plant that is almost five inches across. I'm in tomato heaven.